Sometimes I get really tired of the usual dinner food, which makes me go way outside of the box. With a little help from my FitAddict pal, Andrea, I made a delicious and healthy Sweet Potato and Quinoa Casserole for dinner. I know what you're thinking. Sweet potatoes as the main course for dinner? Yup! 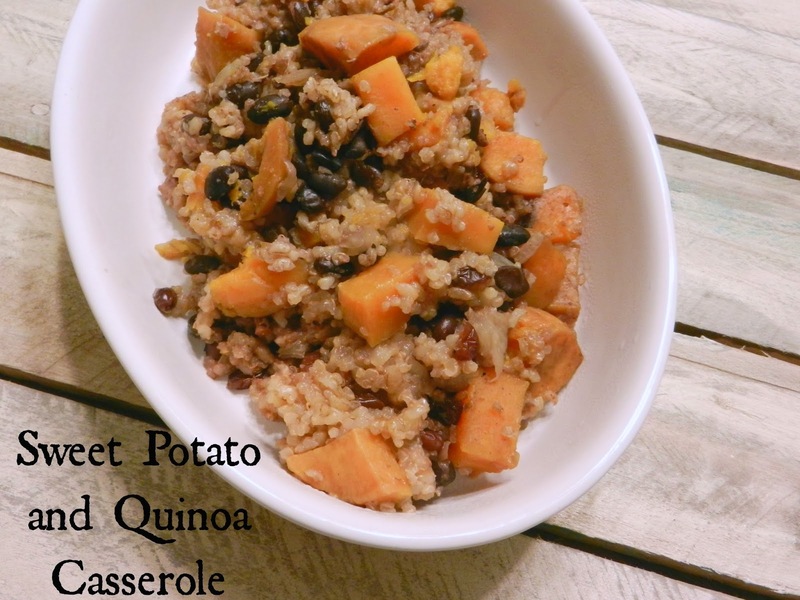 This casserole doesn't just contain sweet potatoes....there are lots more ingredients, (which couldn't all be listed in the title, or you'd think I was completely insane!) making is a complete meal! Don't get me wrong. This could totally be served as a side dish too. In fact, I suggest bringing this to a party or to a work pot luck if you'd like something you can eat guilt-free and still get a complete meal. Being gluten-free, I've found I usually starve at parties unless I bring something like this. You can only eat so many fruits and veggies at one time. Half the time the cheese and crackers are on the same platter, leaving that no longer an option either. Cross contamination is a huge issue for us gluten-free folks. If you bring this casserole, you'll be all set! Andrea made a very similar version of this for her family during the holidays and they loved it. We had mixed reviews here. My husband wasn't a fan at all. I loved it and my kids liked it, but didn't love it. I won't even tell you what my husband added to his when he ate it. It was disgusting. LOL I thought it was perfect as it was. The only thing I would have changed is adding the pecans at the end instead of cooking them with everything. They got soft and you couldn't really tell what they were. They should still be crunchy. This will be reflected below, so you can follow everything as typed below. In your crock, place your sweet potatoes and onions. Add in the maple syrup, cinnamon, pepper, vegetable bouillon and water. Cook on LOW for 5-6 hours and add the chopped pecans just before serving. This has been a family favorite thanksgiving dish for years, passed down by my mom. I’ve never tried using canned sweet potatoes, always boiled and mashed. It would cut down on prep time though. Also, we use crushed corn flakes cereal instead of flour in the topping. Cinnamon pecan corn flakes work great too. Add topping for last 10-15 minutes of cooking time. Yum!